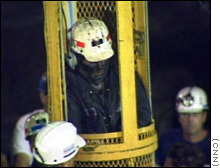 who worked to rescue the trapped miners. I am sure you have been following the rescue of the miners in America. One time was similar to what happened in America. 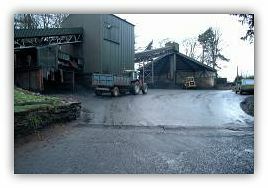 We were doing some test drilling in what is now the last shearer face 2SW main gate, a good way in. We were looking for the whereabouts of the old workings from the 1800s to make sure we had a good enough pillar of coal for the gate. After a few aborted drillings, the rods can dive up or down, into the floor or roof, we made one last attempt. It was a Saturday and we wanted an early finish and thought we were going to get a flyer when we had only a few rods left to put on. The last rods hit the workings. Great, rods out, seal the hole with a wooden plug, pack up and away home. We started to sing and dance! After starting to remove the rods a lot of water started to come out of the drill hole. I checked the water tap for the drilling machine to make sure it was shut off, it was. Never mind we kept on taking the rods off and more but more water started to come out. The last few rods were getting pushed out by the force of the water. It did not look good! We pulled the drilling machine out of the way and tried to plug it. It did not work, the water just pushed past and was now starting to find other ways to come out. We were in a single roadway and the front of the face was staring to fill with water. It was like an underground version of Titanic. Our deputy Barry Tray had an idea to use the smaller hand drill fitted with some extension rods to drill on the low side and try and hit the old west hand fillers. We had several attempts to hit them with no luck. The water was getting high by this time and bitterly cold. 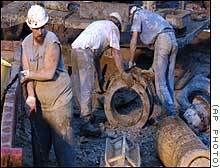 I can understand what the American miners were going through. By this time, the manager had been informed and the under manger was making his way out with a plan of the mine. We kept on drilling for a bit longer and then decided to pull the dintheader back out of the water as it was getting close to the motors. At about 10.00 PM the under manger came in with some extra help. We made our way out, wet, freezing cold, and exhausted while the under manger and the help kept on drilling. I finally finished at 11.00 PM from what was going to be a 1.00 PM finish! The under manager finally hit the workings and helped divert the water. On the Sunday a team of men took a pump in, although by this time the water had started to die down! What seemed like a simple job turned in to a nightmare! I am not sure how a similar attempt would be made over here to save miners in a similar situation. 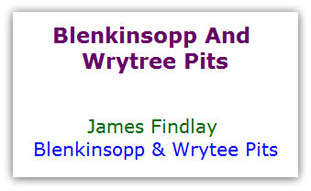 For example Blenkinsopp is at a similar depth, about 300' but the stone is really hard limestone and can have large cavities which can stop drilling altogether. 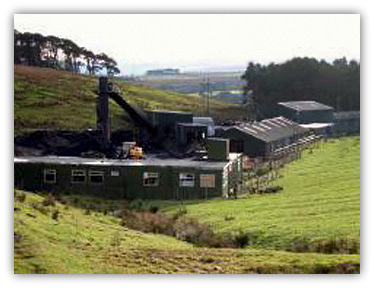 Several test bores were made on the surface to see the extent of the coal but they had to give up in the end due to losing the water in the cavities. The water is needed to flush the waste to surface. So I am not sure if drilling would be possible. The only other way would be to go into the water and to bring them out that way. 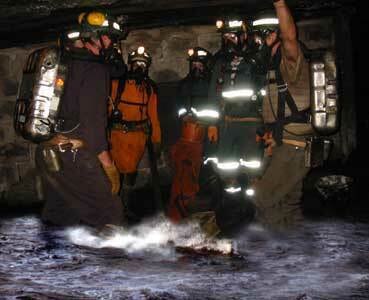 In the mines rescue you are trained to use the breathing apparatus under water. You have a practice every two years in a swimming pool.